If you want a windproof umbrella and money is no object, our favorite model is definitely the Blunt Metro Travel Umbrella. As great as it is, however, many people think $59 is a lot to spend on one umbrella. If you fall into that category, we’ve got a great alternative for you that’s almost as good. The Ecourban Automatic Compact Travel Umbrella can withstand wind speeds that are about twice as fast as anything you would ever find yourself outside in, and it only costs $17 right now on Amazon. 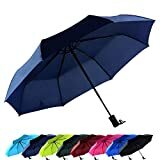 STURDY FRAME CONSTRCTURE, STRONG WINGPROOF: Made of 8 durable fiberglass ribs and steel central shaft, making the umbrella strong sturdy and windproof. It won’t break even flip inside out. Durability tested thousands of times to ensure it won’t be broken in heavy rain. MADE BY 190T PG, WATERPROOF, EASY TO DRY: The umbrella was made of high quality recycling PG fiber, durably to use for a long time. The water-repellent specific makes you more convenient to get in, even without flip, all the rain drops fall down quickly. AUTO OPEN&CLOSE, COMFORTABLE GRIP: The umbrella is automatic designed. You can automatically open and close it in just one second to avoid getting caught in rain. Considering longer lifetime, the folding up feature is hand-driven. Thousands of times operation is stress-free for this straight umbrella. EVA handle makes you feel comfortable when hold and also reduce the total weight. A QUALITY TRUSTWORTHY UMBRELLA: The manufacturing process is strictly inspected to ensure each sport umbrella with high quality. To bring customers the best usage experience, most processes are completed by manual work. QUALITY GUARANTEE – If by any rare chance we missed a defective unit after our stringent quality control, a new one will be sent to you for free. Sale price withheld at the manufacturer’s request. Visit Amazon for pricing. Follow @BGRDeals on Twitter to keep up with the latest and greatest deals we find around the web. BGR Deals content is independent of Editorial and Advertising, and BGR may receive a commission on purchases made through our posts.